Summary (from author's official website): Haven Terra’s soul is in danger, but only she can save herself. 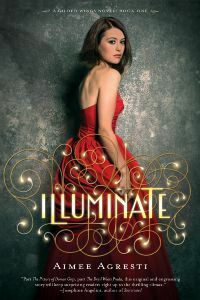 Brainy, shy high school outcast Haven can’t believe her luck when she’s recruited for a prestigious internship at a historic hotel in Chicago, under the leadership of powerful and alluring Aurelia Brown, dashing Lucian Grove and their stunning but aloof staff of glamazons. But just as she becomes seduced by their glitzy and mysterious world, Haven uncovers the evil agenda at the hotel: they’re devils in the business of buying souls. And hers is the most valuable of all: she’s an angel in training and the devils aim to turn her to their side. Will they succeed in wooing her or will she battle back, summoning a strength she never knew she had? Helping her along the way: a mysterious book instructing her to believe in herself; and her budding friendship with soft-spoken classmate Lance, who has a secret of his own. My Summary: Haven never expected to be recruited for the internship at a historic hotel in Chicago, and she doesn't expect to get much out of the experience. Arriving at the hotel, however, Haven is almost overwhelmed by the decadence of the place and its employees: the mysterious Aurelia Brown, Lucian Grove, and the mysterious people they call The Outfit. Haven is swept into the world inside the hotel... but she can sense something isn't quite right, and when she starts digging around, her worst fears are confirmed. Now with the help of a strange book and her friend Lance, Haven must make her choice: will she join the dark-side, or do what she was born to? My Thoughts: I really enjoyed this one! Starting off, I had predicted that the paranormal element might be something like vampires, and that this would be just another vampire book... but man was I wrong. There are no vampires to be found in this novel (so those of you who hate anything vampire can keep reading!). I really liked Haven and Lance's characters, along with Dante (who was hilarious). The creepiness of The Outfit was so well-described - at times I felt like the group itself was a character. The imagery in this novel was great as well. The author does such a great job of describing the hotel and the atmosphere that you can vividly imagine every detail. Final Thoughts: I recommend this novel to anyone who is a fan of darker, edgier paranormal YA.